Six Day London is a wonderful celebration of track cycling, and you can watch the first two hours of every evening LIVE on the Eurosport website. What is Six Day Cycling? Six Day Cycling is a combination of the most entertaining elements of track cycling and non-sporting entertainment. A Six Day race is one of the oldest forms of the sport, but the new version sees the event carried out in a party atmosphere. And out on the track riders compete in multiple events over the six days for an overall title. What is Six Day London? 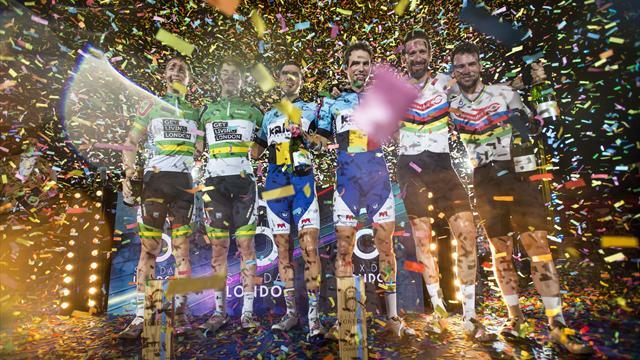 London is part of the Six Day Series, which will feature weeks in Brisbane, Berlin, Copenhagen, Manchester, Melbourne. Six Day London will be held from Tuesday October 24 until Sunday October 29. Six Days of London will be broadcast LIVE on Eurosport 1 and Eurosport Player, with the first two hours of each evening available to watch for free on the Eurosport website. Lee Valley VeloPark will host Six Day London in 2017. The Olympic velodrome in the Queen Elizabeth Olympic Park is one of the most spectacular buildings built for the 2012 Games. A pair of riders will take turns to race, switching roles with a hand sling to propel their partner forward. The rider at the back of the race will be eliminated once every two laps, creating a string of sprint finishes during the race. Each rider has their own pace-setting ‘Derny’, allowing them to benefit from a constant slipstream to reach extremely high speeds. The Omnium is a multi-event race featuring of four different disciplines - a 7.5km Scratch Race, a 7.5km Tempo Race, an Elimination Race and finally, a 20km Points Race. Sprinters race individually for two and a half laps as fast as they can. Another event for the sprinters sees the riders jostle for position behind the pace-setting Derny, who moves out of the way for the last two and a half laps.